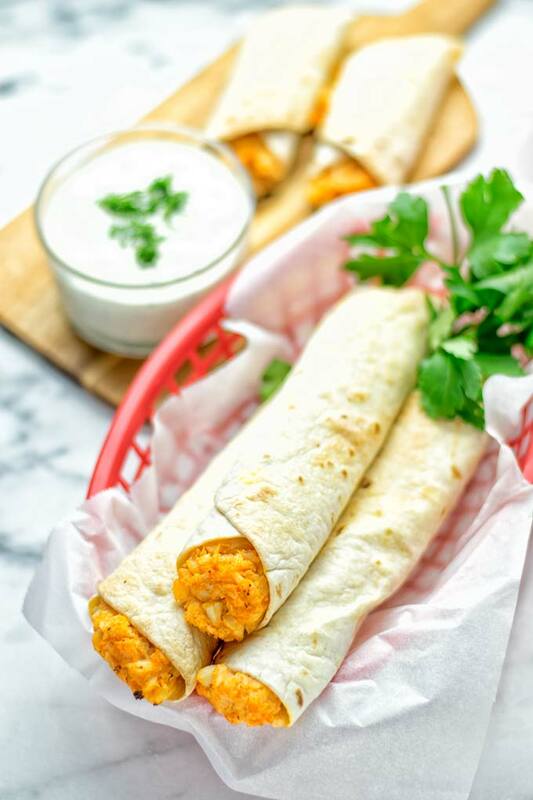 These insanely delicious Buffalo Cauliflower Taquitos are naturally vegan, gluten free, and super easy to make. Perfect for lunch, dinner, and meal prep. Summer for me means: flowers are full in bloom, sunshine. It’s also the time when many people to go on vacation. Discovering all the warm and wonderful weather, hanging out on beaches, inviting friends to potlucks, BBQs, – absolutely a magic time in and out. What’s never missing on those gatherings? Right, good food! You know friends, I definitely have a fondness for taquitos. My all time favorites have been these Spinach Artichoke Taquitos and my Vegan Cream Cheese Taquitos. 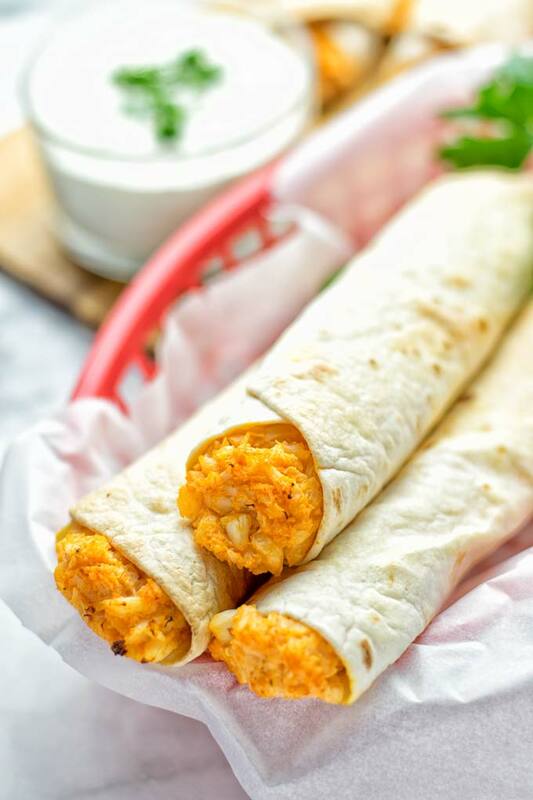 Good food is always the answer and these Buffalo Cauliflower Taquitos surely impress everyone. Who does not love food that is easy to make, delicious in flavor from the center to the top, packable, meal prep ready in no time, relaxing and stress free, mouthwatering, comforting, perfectly crispy, creamy and satisfying. Filling and versatile for lunch, dinner, snacking. And of course it’s one amazing work lunch option, if you want to skip the food courts. Make it fast and fresh and enjoy. Ideally you can set up a bowl with water and soak your cauliflower for a short time, let’s say 3 minutes. Now move over to a colander. Put your cauliflower into it and rinse again under cold water. Note: If you don’t have a colander no worries. Just make sure to clean your cauliflower properly under water. 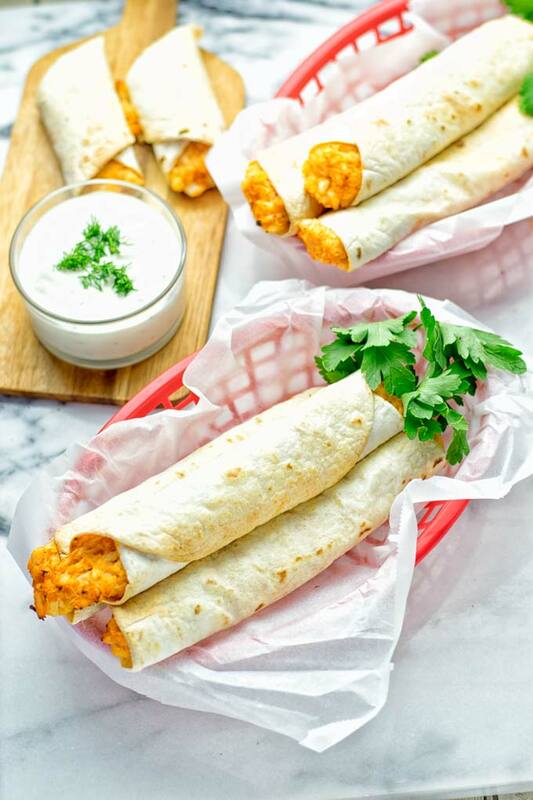 Before we’re going to make these taquitos, it’s great to know how to make buffalo cauliflower in the traditional way. You start with the cauliflower florets, marinate them in vegan butter and hot sauce. Then bake or fry them. We do something different. First we cook or steam the cauliflower florets. Both ways will work. Takes about 10 minutes. You can do this step right before making the taquitos or even a day in advanced for meal prep. As I said how to cook the cauliflower is up to. When it’s done, all you need to do is combining all the ingredients for the filling, like cooked or steamed cauliflower, minced garlic, vegenaise, dairy free cream cheese, and hot sauce. Season with salt and pepper in a bowl and mash with a potato masher into a creamy mix. Note: You can make this also in a food processor. But be careful that the mix does not turn out too silky and smooth. A hand mixer will also work, because you’re able to control the speed better than with a high speed blender. Last and next: fill your tortillas. I used gluten free and medium ones in size, but you can take almost any that you like. Keep in mind if you use bigger ones that you need a bigger amount of filling for each of them. I used 3 tbs and then rolled them into taquitos. Put them on a baking sheet prepared with parchment paper. Now you can spread the optional vegan butter or some oil on the taquitos. It’s not necessary but makes them really crisp. Bake for around 15 minutes at 410°F. Ready to enjoy on plates, plain or with some vegan ranch, hot sauce, salsa or anything you like. Isn’t it easy? It couldn’t get any easier to know how to make taquitos. 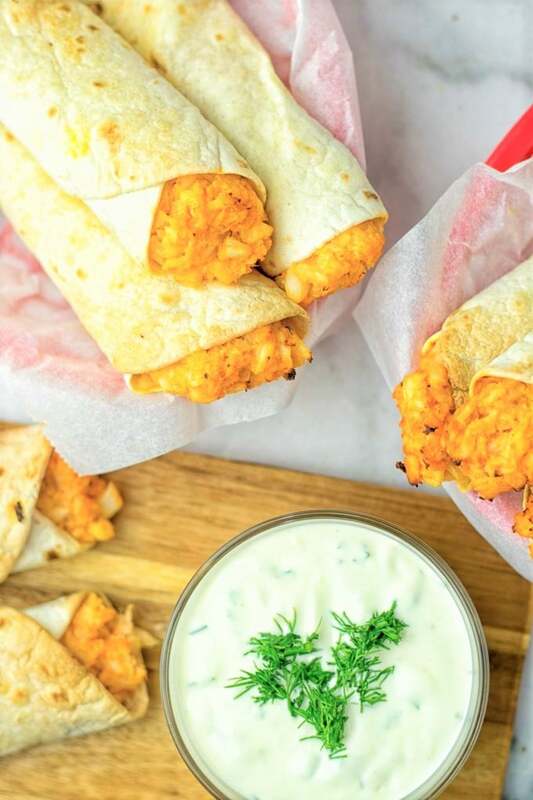 These Buffalo Cauliflower Taquitos are really delicious on their own, but also great for dipping with an amazing sauce. It’s a great dairy free dinner, lunch, snack option. Also made for potlucks, picnics, work lunches, beach hang outs or just because you’re craving something delicious – always right. These are truly satisfying, no one could believe these are made from only 6 basic ingredients that you might already have in your pantry. It’s really a keeper for everyone. 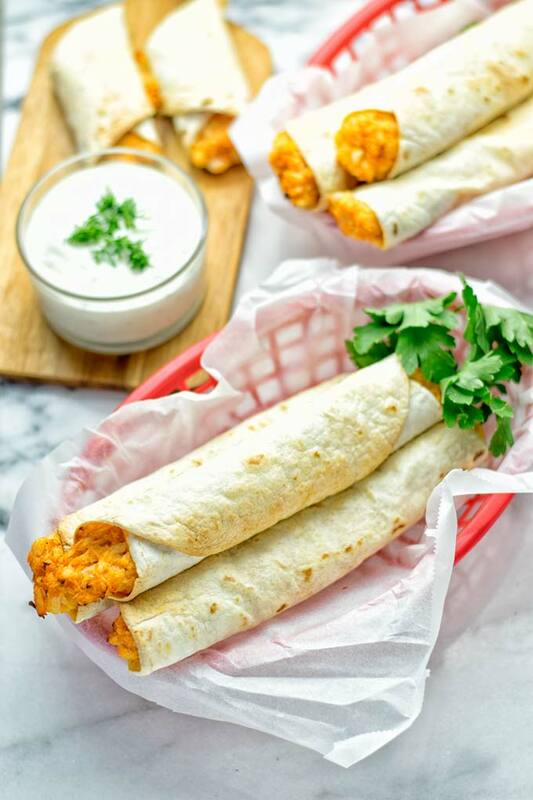 If you give these Buffalo Cauliflower Taquitos a try give me a tag on Instagram and Facebook as always. Take a picture and show off your excitement. First cook or steam the cauliflower florets. Takes about 10 minutes. Check if the florets are tender. 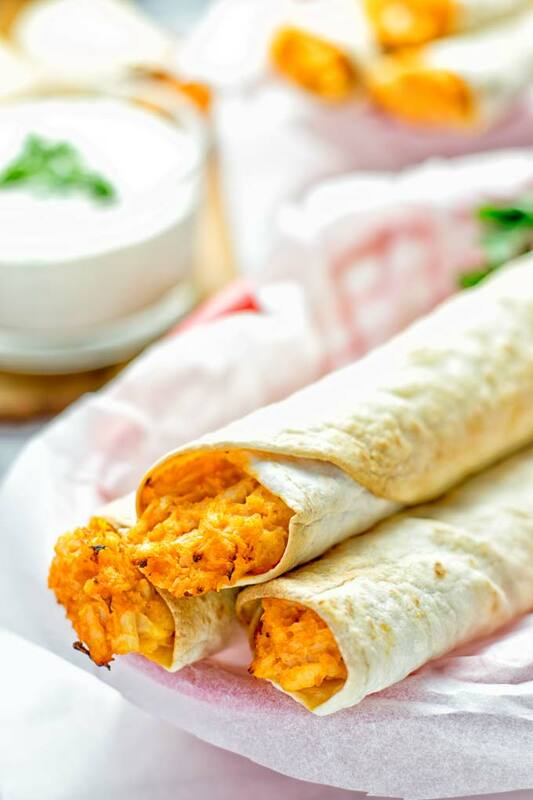 Combine all the ingredients for the filling, like cooked or steamed cauliflower, minced garlic, vegenaise, dairy free cream cheese, and hot sauce. Season with salt and pepper in a bowl and mash with a potato masher into a creamy mix. 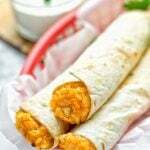 Use 3 tbs of the filling for a medium sized tortilla and rolled them into taquitos. Put them on a baking sheet prepared with parchment paper. Now you can spread the optional vegan butter or some oil on the taquitos. Bake for around 15 minutes at 410°F. Hi! I haven’t tried that before, but I would say why not! Let me know how it goes! Do you think the inside could serve as a dip on it’s own? Hi Natalie! I haven’t tried this! But I guess why not! Let me know what you think! So when I mix it all together I add in the cauliflower pieces with the other ingredients to mix into and paste or how should the consistency look ? Hi Derek! Yes! Just make sure the cauliflower is steamed or cooked before!